Christmas Family Tree : Kathie Hill Music, LLC, Making music with and for kids for over 25 years! The Christmases (Merry, Holly, Jolly and Whitey Christmas) are having their annual family tree trimming party for all the Christmas cousins. 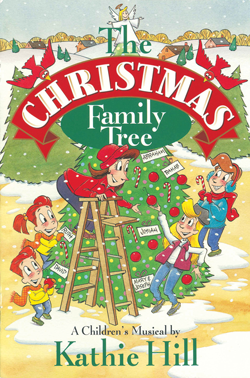 When they invite their neighbor, Abbie Adams to join the fun, the Christmas family shares Jesus’ family tree from Matthew, Chapter One. Through this geneology, Abbie Adams learns of Rahab’s bravery, Ruth’s loyalty, David’s repentance, Josiah’s wisdom and Mary and Joseph’s obedience. But most importantly, she learns that she, too, can be adopted into the Christmas Family Tree of faith. Kathie’s Note: This is a sweet musical that is easy to stage and has a wide variety of musical styles. The adoption “surprise” is especially meaningful and the study of the Old Testament members of Jesus’ genealogy leads beautifully into a salvation message with “Everyone, Everywhere Come” as one of my favorite invitation songs.